Background and objectives: It was postulated that in patients with membranous nephropathy (MN), four weekly doses of Rituximab (RTX) would result in more effective B cell depletion, a higher remission rate, and maintaining the same safety profile compared with patients treated with RTX dosed at 1 g every 2 weeks. This hypothesis was supported by previous pharmacokinetic (PK) analysis showing that RTX levels in the two-dose regimen were 50% lower compared with nonproteinuric patients, which could potentially result in undertreatment. 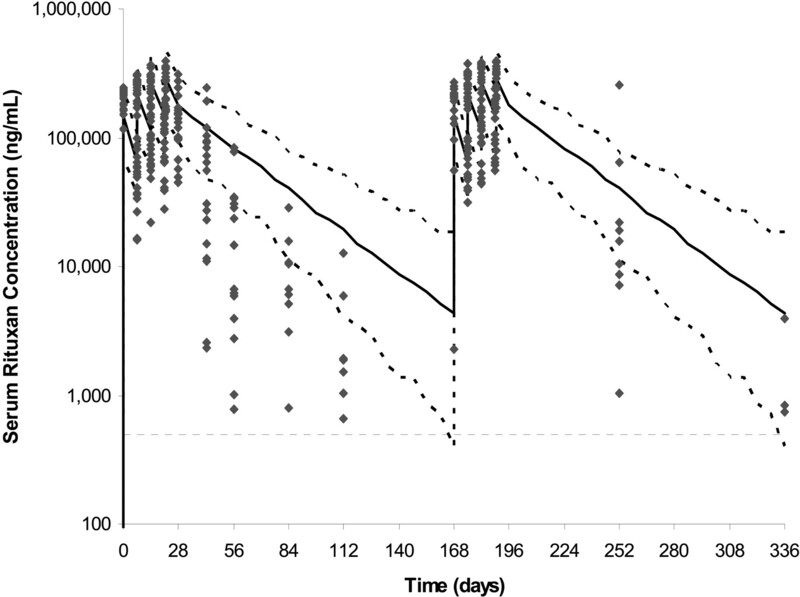 Design, setting, participants, & measurements: Twenty patients with MN and proteinuria >5 g/24 h received RTX (375 mg/m2 × 4), with re-treatment at 6 months regardless of proteinuria response. PK analysis was conducted simultaneously with immunological analyses of T and B cells to ascertain the effect of RTX on lymphocyte subpopulations. Results: Baseline proteinuria of 11.9 g/24 h decreased to 4.2 and 2.0 g/24 h at 12 and 24 months, respectively, whereas creatinine clearance increased from 72.4 ml/min per 1.73 m2 at baseline to 88.4 ml/min per 1.73 m2 at 24 months. Of 18 patients who completed 24-month follow-up, 4 are in complete remission, 12 are in partial remission, 1 has a limited response, and 1 patient relapsed. Serum RTX levels were similar to those obtained with two doses of RTX. Conclusions: Four doses of RTX resulted in more effective B cell depletion, but proteinuria reduction was similar to RTX at 1 g every 2 weeks. Baseline quantification of lymphocyte subpopulations did not predict response to RTX therapy. We have previously reported that in patients with idiopathic membranous nephropathy (MN), treatment with Rituximab (RTX; 1 g, intravenous on days 1 and 15) leads to complete (CR) or partial remission (PR) of proteinuria in 60% of patients at 12 months (1). However, pharmacokinetic (PK) analysis suggested that drug exposure may not have been optimal because RTX levels were 50% of those observed in rheumatoid arthritis (RA), a group with no proteinuria, resulting in a faster B cell recovery in patients with MN (1). On the basis of these findings, we conducted a study postulating that RTX given according to the lymphoma protocol (four weekly doses of 375 mg/m2 each), with re-treatment at 6 months, would result in a more effective and prolonged B cell depletion and a higher remission rate while maintaining a similar safety profile. At the same time, a detailed PK analysis was repeated to assess the drug exposure question. We also measured human anti-chimeric antibodies (HACAs) because development of these antibodies may affect the B cell depletion after RTX and increase the risk for side effects (2). In patients with systemic lupus erythematosus (SLE), RA, and anti-neutrophil cytoplasmic antibody-associated vasculitis (AAV), several abnormalities in peripheral B cells subsets have been described (3–5). In patients with SLE, B cell subset anomalies resolved after RTX therapy in parallel with clinical improvement (6). Similarly, in patients with RA, analysis of B cell subsets correlates with efficacy of response and the likelihood of relapse (4,7). In MN, experimental data suggest that B cells are involved in the pathogenesis of the disease (8). To date, the best proven therapy for patients with MN consists of the combined use of corticosteroids and cyclophosphamide (CYC). Because the mechanism of action of CYC includes suppression of various stages of the B cell cycle, including B cell activation, proliferation, and differentiation and inhibition of Ig secretion, it lends credence to the hypothesis that B cell abnormalities are involved in the pathogenesis of MN (9,10). However, there is a paucity of information on B cell subpopulations in patients with MN and on the characteristics and kinetics of B cell repopulation after RTX treatment in these patients. The data on T cell immunophenotyping in MN patients are sparse, but a high CD4+/CD8+ T cell ratio has been reported as predictive of response to treatment (11). In another study of MN patients, Kuroki et al. demonstrated that T and B cell dysregulation results in Th2 predominance and appropriate cytokine secretion with a concomitant increase in production of IgG4 by B cells (12). Thus, because the mechanism of action of RTX in MN is unknown and response is incomplete (only two-thirds of patients respond), we conducted a systematic and serial evaluation of B and T cells before RTX and at defined intervals after treatment to determine whether baseline values or the kinetics of subpopulation recovery in B and/or T cells influenced clinical outcome. Patients included in the study met the following criteria: (1) biopsy-proven MN; (2) creatinine clearance ≥30 ml/min per 1.73 m2; and (3) persistent proteinuria >5 g/24 h despite treatment with an hepatic hydroxymethyl glutaryl–CoA reductase inhibitor, an angiotensin-converting enzyme inhibitor (ACEI), and/or angiotensin receptor blocker (ARB) at maximal tolerated dose for at least 4 months. The study was approved by the Institutional Review Boards at the Mayo Clinic; the University of North Carolina Chapel Hill; and the University Health Network, University of Toronto and was registered on www.clinicaltrials.gov (identifier NCT00405340). All patients provided written informed consent. Patients who had been on treatment with prednisone, cyclosporine, or mycophenolate mofetil (MMF) within the last 4 months or alkylating agents within the last 6 months were not included in the study. Patients with active infection, diabetes, or a secondary cause of MN (e.g., hepatitis B, SLE, medications, malignancies) were also excluded. At enrollment, a low sodium (<4 g/d) and low protein (0.8 g/kg per day of high-quality protein) diet was recommended and patients were encouraged to maintain the same diet throughout the duration of the study. All patients received a similar conservative treatment regimen that included loop diuretics to control edema, an hepatic hydroxymethyl glutaryl–CoA reductase inhibitor, and an ACEI combined with an ARB if tolerated. Target systolic blood pressure was <135 mmHg in >75% of the readings. Patients who after a minimum of 4 months of conservative therapy and maximized angiotensin II blockade had proteinuria >5 g/24 h received RTX (375 mg/m2) intravenously on days 1, 8, 15, and 22. Patients were re-treated at month 6 regardless of their clinical status. To minimize infusion reactions, patients were orally premedicated with acetaminophen (1000 mg) and diphenhydramine hydrochloride (50 mg). In addition, methylprednisolone (100 mg, intravenously) was given before the first RTX infusion. B cell depletion was defined as CD19+ count <5 cells/μl. All patients received prophylaxis for Pneumocystis jirovecii while B cell depleted. In all patients, clinical and laboratory parameters including complete blood counts, electrolytes, serum albumin, serum immunoglobulins (IgG, IgM, IgA), and a lipid panel were evaluated at study entry and at months 1, 3, 6, 9, 12, 18, and 24. IgG subclasses were evaluated until 12 months post-treatment. Immunological analyses including B cell, T cell, and regulatory T cell (Treg) analysis were performed by flow cytometry until month 18. Creatinine clearance and protein and creatinine excretion in the urine were assessed by performing two consecutive 24-hour urine collections at baseline and at 6, 12, and 24 months, as well as one collection at the other visits. Data were considered accurate when urinary creatinine excretion was consistent with a complete 24-hour collection. The mean of the two measurements was considered for the analysis. The presence of HACAs was evaluated at baseline and at months 3, 6, 9, and 12. Serum RTX level quantification and HACA determination were performed through a proprietary ELISA assay and a proprietary bridging HACA ELISA assay performed at Genentech, Inc. in South San Francisco, California as described previously (1). For quantification of T, B, and natural killer cells, multicolor flow cytometry using a BD Multitest six color U.S. Food and Drug Administration (FDA)-approved kit was performed on whole blood on a BD FACS Canto flow cytometer, and the data were analyzed with FDA-approved clinical software (BD BioSciences, San Jose, CA). Detailed, quantitative B cell subset analysis was performed using peripheral blood mononuclear cells isolated from EDTA whole blood using multicolor flow cytometry. Detailed, quantitative T cell subset and Treg subset analyses were performed on whole blood using multicolor flow cytometry. Quantification (absolute cell count) of all subpopulations in the various assays was performed with BD TruCount tubes. All flow cytometry analyses were performed using FACS Diva software. Statistical analysis for reference values were performed using quantile regression in SAS (Cary, NC) and the mid-95% confidence interval (CI) was obtained for percent and absolute count data. The primary efficacy parameter was defined as change in urinary protein excretion from baseline (week 0) to 12 months post-treatment. With Institutional Review Board permission, the follow-up was extended to 24 months. Monthly changes were tested against zero using the paired t test. Within-patient slopes (from log-linear regression) were used to estimate 12- and 24-months changes using all available urine protein readings. Secondary endpoints included monthly changes in protein; the number of patients with PR or CR at 12 and 24 months; and changes in GFR as estimated by 24-hour creatinine clearance, serum albumin, and lipid profiles. Associations of urine protein with immune response were assessed using Pearson's correlation coefficient. Study sample size was based on the desire to have 80% power to detect a drop in urinary protein of at least 2.0 g/24 h. Assuming a two-sided hypothesis test performed at a significance level of 0.05, and an SD of urinary protein change of 2.5 g, it was determined that 20 patients would suffice (13). Definition of remission status is according to the criteria established by Cattran et al. (14). CR was defined as proteinuria ≤0.3 g/24 h, PR as proteinuria ≤3.5 g/24 h and a >50% reduction in peak proteinuria along with serum albumin >3 g/dl; limited response (LR) as >50% reduction in proteinuria but >3.5 g/24 h), and nonresponse as <50% reduction in peak proteinuria. Any patient reaching a CR or PR was considered a treatment success. Statistical analyses were performed using SAS (Cary, NC) version 9. In the 18 patients who completed 24 months of follow-up, proteinuria decreased from a baseline of 11.9 ± 4.9 g/24 h (mean ± SD) to 4.2 ± 3.8 g/24 h at 12 months and 2.0 ± 1.7 g/24 h at 24 months (both P < 0.001, paired t test). (Figure 1, A and B; Table 2) By the end of 24 months, CR was achieved in 4 patients, PR in 12 patients, 1 patient had a LR, and 1 patient relapsed. The reduction in proteinuria was gradual, and in 18 patients who responded to treatment, the delta (Δ) proteinuria at 24 months was −10.1 ± 5.0 g. Within patient slopes (log scale), the average monthly drop in proteinuria through 24 months was 8.5 ± 6.6% (P < 0.001). The monthly drop in proteinuria through 12 months was 11 ± 8.5% (P < 0.001) and was not significantly (P = 0.4) different from the monthly drop of 15 ± 16% (P = 0.003) obtained in our previous study using RTX (1 g) on days 1 and 15 (1). At 6 months, eight patients showed no response (<50% reduction in proteinuria), but six of those responded to the second course of RTX. The reduction in proteinuria was paralleled by a progressive and significant increase in serum albumin levels from 2.7 ± 0.6 g/dl at baseline (≤3 g/dl in 12 of 20 patients) to 3.7 ± 0.4 g/dl at 12 months (≤3 g/dl in only 1 of 19 patients) and 4.0 ± 0.5 (mean ± SD) at 24 months (Tables 2 and 3). Creatinine clearance increased from 72.4 ± 33 ml/min per 1.73 m2 at baseline to 88.4 ± 31.5 ml/min per 1.73 m2 at 24 months (P = 0.02). Total serum cholesterol and triglyceride levels decreased progressively (P < 0.05, paired t test), whereas systolic and diastolic blood pressure were stable during the study (Table 3). At 24 months, four patients had discontinued all antihypertensive medications, three were taking only ARBs, three patients were taking only ACEIs, and eight patients remained on ACEIs and ARBs. (A) Box plots of urine protein by months since start of RTX therapy. The top and bottom of the box are the estimated 75th and 25th percentiles, respectively. The intermediate horizontal line and “+” sign represent the median and mean urine protein, respectively. The vertical lines extend to the largest (smallest) data point that is within 1.5 times the interquartile range (75th to 25th percentile) above the 75th percentile (or below the 25th). The square symbol identifies points outside of this range. The number of patients with follow-up at 0, 1, 3, 6, 9 12, 18, and 24 months are 20, 20, 20, 19, 18, and 18, respectively. *P < 0.05, **P < 0.001. 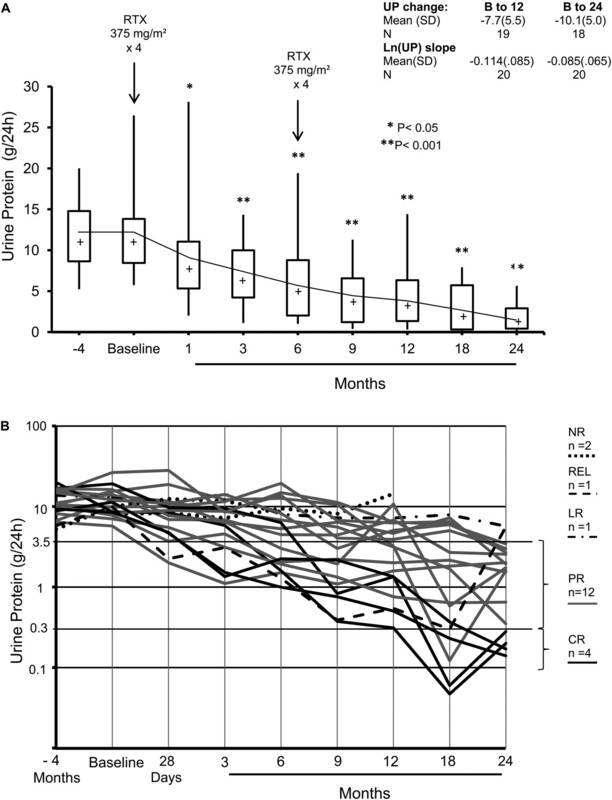 (B) Longitudinal effect of RTX on proteinuria (log-transformed). There were significant changes in serum IgG and IgM levels, with baseline IgG levels relatively increasing toward the normal range and IgM levels decreasing at 12 months and later. Serum IgA levels remained stable over the 2-year time period. Quantification of IgG subclasses showed that the increase in total IgG was due to an increase in IgG1, IgG2, and IgG3 isotypes, whereas IgG4 levels remained unchanged (Table 4). Two patients did not respond to the treatment. One patient who was immunosuppression naive before entry was removed from the study at 6 months because of worsening proteinuria and rapidly declining kidney function. He was treated with prednisone and CYC and went into CR. A second patient, who had failed combined prednisone and CYC as well as MMF, also did not respond to RTX. He was subsequently treated with Tacrolimus and went into PR. The adverse events observed were mainly infusion-related reactions and none were serious. Three patients developed itchy throat, nasal congestion, and face flushing during their first infusion. Four patients developed flu-like symptoms 24 hours after the first infusion. Two patients developed a minor skin rash: one on infusion day 1 and one on infusion day 1 at 6 months. No treatment was administered for the rash. One patient developed a metallic taste after each infusion. One patient was hospitalized for possible community-acquired pneumonia 2.5 months after the first set of infusions; this resolved with oral antibiotic treatment. One patient had a myocardial infarction 5 months after the first set of infusions. Serum RTX levels were calculated as 200 ± 34 μg/ml on day 1 after first dose, 54.7 ± 23.6 μg/ml on day 8 (predose), 229 ± 49.9 μg/ml on day 8 (postdose), 88.5 ± 35.4 μg/ml on day 15 (predose), 247 ± 62.7 μg/ml on day 15 (postdose), 101 ± 46.2 μg/ml on day 22 (predose), and 257 ± 71.5 μg/ml on day 22 (postdose). These levels are similar to the RTX levels seen in our first study with RTX given as 1 g at day 1 and day 15 (1) but are considerably lower when compared with the serum RTX concentrations in RA patients (Figure 2), thereby resulting in a shorter half-life of RTX in the MN population. In patients with MN, RTX clearance and volume of distribution were calculated as 0.472 ± 0.0192 L/d and 7.05 ± 0.392 L, respectively, whereas the terminal half-life was calculated as 11.5 days. In patients with RA, the typical population estimate of RTX clearance and volume of distribution were 0.335 L/d and 3.10 L, respectively, whereas the terminal half-life was 18.0 days. Upon re-treatment with RTX at 6 months, it was observed that the levels of RTX till the fourth infusion were similar to the first treatment. However, the concentrations of RTX were higher (Figure 2) upon re-treatment beyond 3 months after the last dose when compared with the 3-month levels upon the first treatment. This might suggest that proteinuria had a significant effect on RTX levels during the first treatment (i.e., when the patients had not responded to therapy), but the RTX levels increased upon re-treatment (i.e., at a time when mean proteinuria levels had reduced by half in response to treatment). However, there was no correlation observed between the degree of proteinuria and RTX levels, between RTX levels and serum albumin, or RTX levels and fractional excretion of IgG (data not shown). Observed serum RTX concentrations from patients with MN versus PK profile simulated using model derived from the estimated PK parameters and inter- and intraindividual variability for RA patients treated with RTX (375 mg/m2 × 4). Gray symbols represent the original observations. Solid black line represents the median of the simulated data in RA patients, whereas black dashed lines represent the lines 5th and 95th percentiles, respectively. By day 56, most patients with MN have RTX levels that are below the 5th percentile for patients with RA. Initial CD19+ B cell depletion was seen in all patients (Table 5). At 3 months, CD19+ B cells started to recover, although at 6 months, most patients still had counts below the reference range (only 3 of 20 patients had >100 cells/μl; Figure 3). 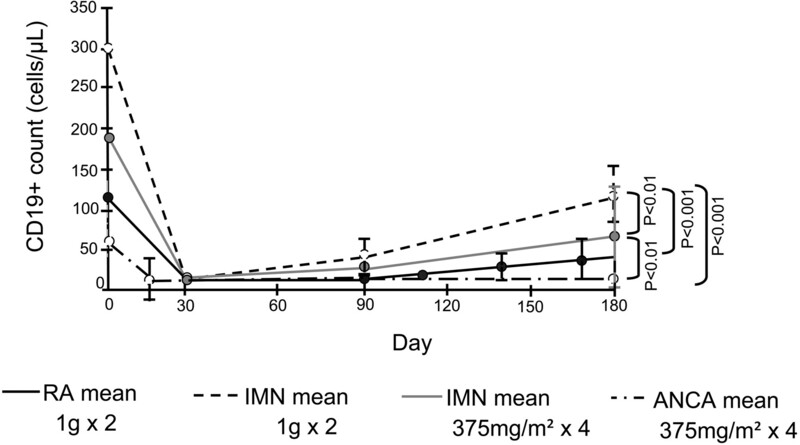 Although B cell depletion was greater in this study than observed with the RTX 1 g every 2 weeks, it was still not as sustained as observed in patients with AAV treated with an identical dosing regimen (Figure 3). Very low RTX serum concentration levels were seen in three patients at month 3, perhaps explaining their rapid return to their B cell counts. With exception of these three patients, we found no correlation between RTX levels and the degree of B cell depletion, and even here there was no relationship to the clinical response. All patients had undetectable serum RTX concentrations at 6 months. In response to the second treatment cycle, all 19 patients again showed complete depletion of peripheral B cells, although most patients had not achieved complete B cell reconstitution after the first cycle of RTX. There was no significant correlation between baseline CD19+ B cell counts and change in proteinuria at 12 or 24 months (R2 = 0.0005 and 0.002; P = 0.9 and 0.8, respectively) or between baseline CD 19+ B cell counts and time to response in proteinuria. Similarly, there was no significant correlation between B cell depletion and the severity of initial proteinuria, or between degree of proteinuria and RTX half-life (data not shown). Dynamics of CD19+ B cells in patients with idiopathic MN versus RA versus AAV. Patients with MN were treated with RTX (1 g intravenously) on days 1 and 15 in our previous study (1) and with 375 mg/m2 × 4 on days 1, 8, 15, and 22 in this study. Patients with RA were treated with RTX (1 g intravenously) on days 1 and 15, and patients with AAV received RTX (375 mg/m2 × 4) on days 1, 8, 15, and 22 (1). Quantification of B cell, T cell, and Treg subsets, along with the CD4:CD8 T cell ratio, is presented in Tables 5 and 6. In patients with MN, baseline B and T cell subset numbers were within the normal reference range for our laboratory. Individual patients showed a similar pattern of B cell reconstitution after each cycle. The early phase of B cell recovery was characterized by complete normalization (within reference values) of transitional B cells (CD38++IgM++), IgM-only memory (CD27+IgM+IgD−), and CD21low B cells by 6 months post-treatment. B cell reconstitution at 12 months (after a second cycle of treatment at 6 months) showed almost identical patterns of B cell subset recovery (Table 5). In the T cell compartment, there was a statistically significant but likely biologically insignificant transient increase in total CD3+ and CD4+ T cells that returned to baseline at 9 and 12 months (Table 6). None of the Treg subset analyses showed significant quantitative differences. The only persistent change in lymphocyte subsets was a relative increase (within reference values) in natural killer cells that persisted up to 18 months (data not shown). The baseline quantification of B cell subsets, Treg subsets, or T cell counts did not predict proteinuria response to RTX therapy. Contrary to previous reports (11), the baseline CD4+/CD8+ ratio also failed to predict response to RTX (CD4+/CD8+ ratio at baseline versus proteinuria at 12 months: R2 = 0.08; P = 0.25; at 24 months R2 = 0.07; P = 0.29). In the two patients who failed to respond to RTX, the CD4+/CD8+ ratios were 1.71 and 2.4, whereas in the three best responders, the CD4+/CD8+ ratios were comparable at 1.92, 1.31, and 2.48 (Table 6). Immunodepletable HACAs were detected in very low titers in two patients only at 6 months (titers = 7.49 and 176 ng/ml, respectively; >10,000 ng/ml considered high titer); neither of these patients demonstrated any side effects. This study represents the largest prospective analysis to date evaluating RTX in the treatment of MN with 2 years of follow-up. The study also provides the most detailed PK and immunological analyses that have been conducted in patients with MN on RTX therapy. On the basis of these data, RTX appears to be effective in reducing proteinuria in a significant number of patients with MN. At 12 months, CR or PR occurred in 10 of 20 patients, or 50% (exact 95% CI 27% to 73%; Table 2). These overall results are in agreement with previous work by Ruggenenti et al. using the same four weekly doses of RTX (decrease in proteinuria 66%) at 12 months (13,15) and with our own previously reported work using two doses of RTX (1 g each; 48% reduction in mean protein levels) (1). Contrary to our hypothesis, we found no significant differences in the response rate at 12 months between patients treated with RTX 1 g every 2 weeks versus those treated with RTX 375 mg/m2 × 4. Thus, the two-dose regimen appears to be equally effective as the four-dose regimen but has the advantage of a reduced number of infusions (and hence lower cost). Similar results have been reported using a single dose of RTX according to a B cell-driven protocol (16). Perhaps more importantly, in patients who responded to RTX, proteinuria continued to decrease, and of the 18 patients who completed a 24-month follow-up, 4 are in CR (22%), 12 are in PR (67%), 1 has a LR (5.5%), and 1 patient relapsed (5.5%). At the end of a 2-year follow-up period, a CR or PR was observed in 16 of 20 (80%) patients. When interpreting these findings, we should take into account that >50% of these patients had failed previous immunosuppressive therapy. This study also emphasizes that proteinuria is reduced gradually and may take several months to reach its nadir, an observation that is in agreement with previous reports in patients with MN treated with prednisone in combination with a cytotoxic agent but without the short-term toxicity seen with alkylating agents (17). Kidney function remained stable or improved in all patients. These results need to be interpreted in light of the fact that in patients with nephrotic syndrome (NS), serum albumin levels influence tubular creatinine secretion. As a result, the endogenous creatinine clearance overestimates GFR in NS (18). Similarly, MN is associated with a severe depression in the hydraulic permeability of the glomerular capillary wall that is partially offset by enhancement of filtration surface area and by profound depression of glomerular oncotic pressure (19). As a result, GFR initially remains in the normal range or is depressed by <50% in patients with moderate MN. The fact that these abnormalities were reversed with resolution of the NS, together with the fact that several patients had their angiotensin II blockade reduced or discontinued with time, may explain the significant increase in creatinine clearance observed at 24 months. This represents a substantial advantage over the risk for nephrotoxicity and other short-term toxicities associated with the use of calcineurin inhibitors. More importantly, the effect appears to be sustained because only one patient (5%) relapsed within the 2-year follow-up period. These results are similar if not better than those reported by Ponticelli et al. in which 4 of 42 patients (10%) treated with a 6-month course of methylprednisolone and chlorambucil relapsed within 2 to 3 years of treatment (20), but contradict the data obtained with calcineurin inhibitors or prednisone combined with MMF in which a >40% relapse rate is commonly seen soon after discontinuation of therapy (14,21,22). There was no difference in proteinuria response between patients who were immunosuppression naïve versus those who had been previously treated. Only two patients failed to show a significant improvement in proteinuria even after two courses of the RTX therapy. It is possible that in these two patients, failure to therapy was due to polymorphisms in the FcγRIII gene that is known to modulate responses to RTX (23). This was not investigated in the study presented here. In patients with lymphoma treated with an identical 4-week course of RTX, B cell reconstitution typically begins at 6 months, with most patients achieving normal circulating B cell counts by 1 year (24,25). This contrasts with our previous study in which CD19+ B cell recovery was already observed at 3 months and was complete in all patients by 6 months (1). In the study presented here, CD19+ B cell depletion was more profound and persisted longer when compared with our previous cohort, but recovery was still faster than previously observed in our AAV patients (nonproteinuric) treated with the identical dose and schedule of RTX infusions. The faster rate of B cell recovery in patients with MN, when compared with the rate of B cell recovery in patients with RA or AAV who had been treated with RTX monotherapy, suggests that the duration of B cell depletion may be in part related to premature loss of RTX, resulting in lower levels. We had speculated that high-grade proteinuria may lead to urinary losses of RTX, but we were unable to observe a correlation between RTX levels and the degree of proteinuria. Certainly, serum RTX levels are not a good predictor of its efficacy because neither the peak nor nadir correlates with response at any time point during the study. We found no baseline B cell abnormalities nor any quantitative abnormalities in B cell subsets that helped predict response to RTX in patients with MN, as opposed to patients with SLE (in which the number of circulating memory B cells (26)) or AAV (in which the percentage of activated peripheral B cells) correlates with disease activity. In addition to the production of pathogenic antibodies, B cells may exert a significant role in autoimmunity by regulating T cell function (27–29). To gain further insight into the pathogenic role of B cells, we evaluated the study patients for possible B cell depletion-induced changes in peripheral T cell subsets and correlated these findings to clinical outcome in MN. After RTX therapy, MN patients exhibited only transient changes in total CD3+ and CD4+ T helper cells that returned to baseline values at 9 and 12 months. In contrast to the report by Zucchelli et al. (11), quantification of the CD4+/CD8+ T cell ratio in our 20 patients did not predict response to RTX therapy. As was the case for B cells, T cell counts pre- or post-RTX treatment did not correlate with clinical response. However, T cell subset analysis was performed in only half of the study population (n = 10); therefore, the study may have been underpowered to detect a significant relationship. In our previous study, using two doses of RTX, HACAs were observed in 6 of 14 (43%) patients, but this did not appear to influence the response to therapy (1). However, HACAs have been associated with a more rapid RTX clearance and less effective B cell depletion (2), and HACAs may prevent future re-treatment of disease recurrences because of the increased the risk for adverse reactions, including serum sickness. In the study presented here, only two patients transiently developed low titers of HACAs. Because patients treated with RTX (375 mg/m2 × 4) are less likely to develop HACAs (30) compared with patients treated with single doses of RTX (2), we hypothesized that the degree of B cell depletion directly correlates with formation of HACAs. Therefore, we speculate that in patients with MN, single doses of RTX may not produce the degree of B cell depletion required to avoid formation of HACAs, which could potentially reduce the capacity to re-treat patients with this agent. The results of our study strongly support a role for RTX in MN and offer a more selective treatment approach (13). The 80% CR or PR rate (exact 95% CI 56% to 94%) we observed at 2 years cannot be explained by the traditional reported rate of 30% spontaneous remission in patients with MN. Spontaneous remissions are more common in women and in patients with subnephrotic-range proteinuria (31), whereas in patients with higher grades of proteinuria such as in our population, the spontaneous remission rate is lower (32). Similarly to previous reports, RTX was well tolerated with infusion reactions being the most common side effects (33). However, recent reports regarding the development of unusual infections (e.g., progressive multifocal leukoencephalopathy after the use of RTX in patients previously treated with multiple immunosuppressive drugs (34)) raise the need for caution before its widespread use. Limitations of this study include lack of a randomized design, no placebo control, and limited sample size. Furthermore, follow-up beyond 2 years is required to assess the durability and safety of the RTX response. In conclusion, RTX appears to be effective in achieving a CR or PR of proteinuria in a significant number of patients with MN. The results are even more remarkable considering that over 50% of the patients had failed the best-recognized therapies before treatment with RTX. Although the beneficial effect of RTX likely results from the depletion of B cell clones responsible for producing pathogenic autoantibodies, we found no correlations with either B cell counts, their subsets, or changes in T cell parameters. We found that proteinuria appears to have a significant effect on the PK and pharmacodymamics of RTX, but again the effects on efficacy could not be determined. We believe that significant preliminary work has been done regarding the use of RTX in patients with idiopathic MN, and that the time has come to conduct a rigorous, prospective randomized controlled trial with the use of RTX to truly assess its efficacy and durability compared with traditional specific immunosuppressive treatment. The study was supported by an unrestricted research grant from Genentech, Inc., South San Francisco, California; Biogen Idec, San Diego, California; the Fulk Family Foundation; the Department of Laboratory Medicine and Pathology, Mayo Clinic, Mayo Clinic Foundation; and by a grant (UL1-RR24150) to the Center for Translational Science Activities. We thank Mrs. Lori Riess for her outstanding role as research coordinator for the study, Ms. Jenna Erickson for compiling the immunological data, the clinical staff of the Cellular Immunology Laboratory who performed the immunological studies, and Dr. Anand Banmeet at Genentech, Inc. for the analysis of the PK data. Part of this material was presented in an abstract form at the annual meeting of the American Society of Nephrology; October 27 through November 1, 2009; San Diego, California.